One of the beliefs of our mission statement is to provide quality and compassionate care. To achieve this, we have made some minor changes on how we will be handling all prescription medication. Sharing medication is prohibited. All patients will need individual prescriptions which will ensure that each patient's medical record is reflecting the appropriate medication, dosage, and duration. State's guidelines require a valid veterinary-patient relationship which is a minimum of a yearly physical examination. We pride ourselves in providing up-to-date care for your pets. Please speak with one of our team members if you should need further clarification. Dr. David M. Rutledge, V.M.D. | Dr. Richard C. Trayes, V.M.D. | Dr. Brittany A. Gross, V.M.D. | Dr. Maryann Ostrander, D.V.M. Located in Honesdale, PA the veterinarians at Cherry Ridge Veterinary Clinic are committed to your pet's health. The Cherry Ridge Veterinary Clinic excels in the science of veterinary medicine and was founded in 1963 by Dr. John P. Burlein and is now owned by Dr. David Rutledge. Since then Dr. David Rutledge, Dr. Richard Trayes, Dr. Brittany Gross, and Dr. Maryann Ostrander, and our staff have excelled in compassionate veterinary care in the Honesdale area. Cherry Ridge Veterinary Clinic is a full-service animal hospital whose mission is to provide the highest standard of veterinary care for pets. We provide friendly, informative, and supportive services for you and your pet, while maintaining a superior working environment for our employees. 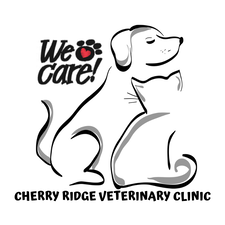 Cherry Ridge Veterinary Clinic offers the local community an array of veterinary services including medical, surgical, and dental care. With an in-house pharmacy and laboratory, digital radiography, and access to specialists our facility offers "one- stop shopping" for your pet's health and well being. "Our goal is to treat our clients as we would treat our families, and to treat our clients' pets as though they were our own." Book your visit online, at any time. Online Scheduling available! Click here! Dr Gross is a 2013 graduate of the University of Pennsylvania School of Veterinary Medicine. Following veterinary school she completed an Emergency and ICU internship at Dove Lewis Emergency Hospital in Portland, Oregon. She returned to Pennsylvania to continue working as an emergency veterinarian at Veterinary Referral and Emergency Center (VREC) in Clarks Summit, PA. In 2015 Dr Gross began working relief at Cherry Ridge Veterinary Clinic and joined the clinic full time in 2016. Dr. Maryann Ostrander graduated from The Ohio State University College of Veterinary Medicine in 2015. Prior to obtaining her DVM, she graduated with a Veterinary and Biomedical Sciences degree at Penn State University. Her professional interests include internal medicine, behavior and wellness/preventative medicine. Dr. Ostrander is a member of the AVMA and PVMA.